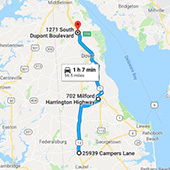 At Delmarva RV Center we provide outstanding service to our customers. From the first steps of looking for the right RV, whether online or in-person at one of our locations, we work to exceed expectations. We foster that relationship by assisting customers with RV maintenance, service, and parts as long as they enjoy the vehicle. In addition to job seekers with excellent customer service, we want applicants who are good learners and leaders. Through continual training, we promote and refine best practices, while Delmarva RV Center’s management stays involved to share the wisdom they’ve gained through years working in the RV industry. We're looking for employees who share our core values of integrity, teamwork and success.Are you a team player who relishes giving customers the best service possible? We might have a spot for you! Do proper meet and greet with customers. Approach, greet, and offer assistance or direction to any customer who enters the showroom or sales lot. Assist customers in selecting the product which best fits their needs by asking questions and listening carefully to their responses. Advise on towing requirements if applicable. Perform a high-quality, professional, and knowledgeable presentation and demonstration of new/used products. Present and sell all makes and models of new and used units. Present and sell other value added options. Write deals to present to sales manager following proper sales plan as presented by the Sales Manager. Maintain regular follow up with prospective and current clients. Properly record all customer contacts in CRM. Must follow the customer contact management system outlined by the Sales Manager. Prepare preliminary used vehicle appraisals. Be knowledgeable in the tent trailer, fifth wheels, trailers, and motorized fields. May be asked to assist in transport and moving of unit inventory. Comfortable with compensation based on commission sales. Quality customer service skills and possess strong communication skills. Integrity, professionalism, motivation and a positive attitude with a desire to excel. Continuous product study and knowledge. Advanced knowledge of computers and software. Proven sales and customer service success within the RV industry. Knowledge of the RV market. Respond promptly to customer needs; solicit customer feedback to improve service; respond to requests for service and assistance. Must have a clean and valid driver’s license. Must be willing submit to a drug screen prior to employment. Knowledge of RV’s and previous sales experience preferred. Driver’s license and driving abstract is required for those who will be driving units on the lot. This position is primarily mobile. Employees must be able to stand for long periods. Ability to bend, kneel, squat and twist.